At Asheville Academy for Girls, troubled girls actively participate in the local community. 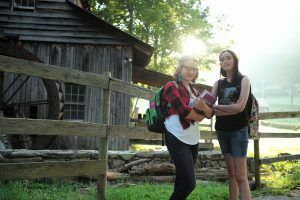 While many camps for troubled girls are removed from the outside world, at Asheville Academy for Girls integration into the local community is a vital part of the experience. By performing volunteer work and interacting with the world, students at Asheville Academy for Girls can see their effect on others firsthand. Many students at Asheville Academy for Girls have had trouble adjusting to a traditional schooling environment. Whether due to inattentive teachers, unhealthy peer relationships, mental illness, or another factor, for many girls, standard classrooms have become a chore, rather than a place of learning and joy. At Asheville Academy for Girls, we make learning fun once again. Small class sizes led by highly-trained teachers with years of experience guarantee that every child gets the attention they need to succeed. Therapy sessions help the students learn teamwork – which, in turn, boosts school performance. 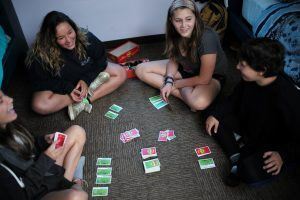 By promoting experiential learning and mindfulness, Asheville Academy for Girls helps students feel the connections between book learning and the real world. A therapeutic boarding school offering long-term treatment, Asheville Academy for Girls combines residential treatment with a boarding school in order to offer girls a unique therapeutic experience. At Asheville Academy for Girls there are no boundaries between academics and treatment; in fact, both serve to reinforce each other. With the Asheville Academy for Girls approach, struggling girls can receive the full schooling experience in a nurturing, safe environment. With a wide variety of activities – from the numerous approaches to therapy (such as animal and equine assisted therapy) to fun lessons and outdoors events — Asheville Academy for Girls ensures that no two days are the same. Although Asheville Academy for Girls is located in North Carolina, we accept struggling girls from all across the United States. With the help of Asheville Academy for Girls, girls troubled by a wide range of issues such as relationship troubles, mental health problems, or social skills issues can find their way to a healthy path. There are many issues that can befall a child while they are growing up – and early adolescence is an especially tumultuous period in that regard. For many families, this is the first time their daughter might encounter bullying, relationship issues, self-esteem issues, or even mental illness. As a consequence, some girls might begin to struggle academically, while other may lash out, become defiant, or refuse school altogether. Although a summer camp for troubled girls might serve as a temporary solution, upon returning home, many girls will fall back into the same, dangerous patterns as before. This is precisely where Asheville Academy for Girls can help. A long-term solution for a variety of issues that adolescent girls face, Asheville Academy for Girls is a therapeutic boarding school that combines the best features of a summer camp for troubled girls, a residential treatment center, and a highly-acclaimed academic program. At Asheville Academy for Girls, struggling girls can experience all the best parts of going to school while being in a completely safe, nurturing environment. By combining therapy with academics, Asheville Academy for Girls allows for every girl to receive the treatment they need without any jarring boundaries between therapy and real life. With a wide variety of therapeutic approaches – such as equine assisted therapy — Asheville Academy for Girls ensures that every day is an adventure. Regulate and manage emotions: Young girls struggling to control their emotions due mood disorders or anxiety disorders. Respect authority figures: Asheville Academy helps girls struggling with defiance and other challenges which makes it difficult to follow directions from parents, teachers, and other adults. Form close relationships with peers and family members: We help girls who struggle in social situations to make friends with their peers and open up to members of their family. Become more resilient: We help girls get back on their feet after some situation in which they need to overcome adversity, such as being bullied. Develop communication skills: Helping girls create lines of communication with family members and peers in order to open up about feelings.